Ages 5 through 16. This book includes pictures and stimulus materials that can be used to develop proficiency in both the structural and functional (pragmatic) aspects of communication. The activities are designed primarily for use with language-impaired children who have difficulty formulating grammatical sentences, sequencing information, or using vocabulary effectively to achieve specific goals. 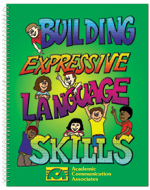 Skills emphasized include asking questions, describing, giving definitions, telling stories, making comparisons, giving explanations, and using basic language structures such as pronouns, the present progressive, and regular/irregular past tense verbs. The student will develop greater precision in the use of vocabulary. The student will be able to provide sufficient information to the listener to convey messages effectively. The student will be able to function effectively in roles as listener and speaker during dialogues with others in a variety of communication situations.